There is a grieving process you go through whenever someone you love dies. When that death is the result of a work related accident or disease, the grief is often compounded by the belief that the death or illness could have been prevented. 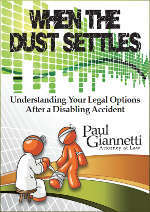 Paul Giannetti, Attorney at Law, understands how difficult a time like this is. If you were financially dependent on the relative who died, your grief is combined with stress as you wonder how you will now pay your bills. Workers’ compensation is insurance that provides you some compensation for your loved one’s death if that death was caused by a work-related illness or injury. Whether or not you are entitled to death benefits depends on your relationship to the deceased, and whether or not you were financially dependent upon the decedent’s income. The decedent’s child who is under the age of 18. A child of the decedent who is under the age of 23 if that child is enrolled full time in an accredited educational institution. A child of any age who was totally blind or permanently disabled at the time of the decedent’s death and who was financially dependent upon the decedent. Are the decedent’s grandchildren or siblings who are either under the age of 18, or under the age of 23 and a full-time student, or any age if the person was totally blind or permanently disabled at the time of the decedent’s death. The deceased worker’s financially dependent parents or grandparents. If a person is eligible for death benefits, they must take certain steps and follow certain rules in order to collect those benefits from workers’ compensation. In order to file your claim for workers’ compensation benefits, you must file the State of New York Form C-62 (1-11) with the Workers’ Compensation Board. You also must give notice to the decedent’s employer that the employee, your loved one, has died. The names and addresses of the decedent and his or her employer, the workers’ compensation insurance carrier, and your name as the claimant. Date of the death with the death certificate attached to the form. Detailed information about the date, time, and place of the accident or illness and how it was work related. Name of attending physician and hospital. You must also attach State of New York Workers’ Compensation Form C 64 (1-11). This requires a statement from the last treating physician confirming the cause of death was a work-related accident or illness. You must provide supporting evidence of all those who are eligible to file for benefits. For example, if you are the spouse, you must provide a copy of your marriage license. If children are included as claimants, their birth certificates must be attached. Students under the age of 23 must provide documentation that they are enrolled full time in an accredited educational institution. Others who qualify must also provide documentation of their relationship to the deceased and verification that they were dependent upon the deceased for support. A claim for workers’ compensation death benefits must be made within two years of the worker’s death. If you let the deadline pass, you lose forever your right to file a claim no matter how desperately you may need and deserve compensation. The time after a loved one has died due to a work-related injury or illness is stressful. While going through the grieving process, those who were financially dependent on the deceased no longer have income to pay the bills that still keep coming in. There are also funeral expenses and there may be medical expenses related to the death. You may know you can collect death benefits, but the paperwork involved, and the task of accumulating the necessary documentation can seem overwhelming. This is a time to contact workers’ compensation attorney Paul Giannetti for help. He offers a free consultation so you can tell him what you think you need and he can tell you what he can do to help.